T-Pain, once celebrated for being an innovator of Auto-Tune, hasn’t released an album in four years. After a brief struggle with depression following a sudden increase in criticism over his use of vocal effects, he shockingly reemerged last year sans–Auto-Tune with a keyboard-driven set for NPR’s Tiny Desk Concert series. Last week, he released a brand-new, free mixtape, The Iron Way, that’s a refreshing throwback to his hitmaking days. Vulture recently spoke to T-Pain about how his new music serves as a reintroduction, what’s going on with his Aaliyah collaboration, his Furious 7 cameo, and why getting FKA Twigs on his upcoming album might not be so easy. You laid low for a couple years, then bounced back last October with that Auto-Tune–less NPR Tiny Desk Show that got rave reviews. Does it feel like you’ve had to reintroduce yourself to the public in a new way? A little bit. I feel like people have a new perspective on how the music sounds. People can actually see that I do sing all my songs. But it hasn’t been difficult [and doesn’t] take away from my previous years. It just enlightens people on how good I sound so far. What made you decide to do that show without Auto-Tune? You seemed slightly nervous at the beginning. They called and asked me to do it. I wasn’t nervous to be singing, I just get real weird around a group of people like that. [Laughs.] I don’t know if I feel social anxiety, or if the ADHD’s probably kicking in. It just gets a little overwhelming because they say they’ve never had that many people watching an artist do a Tiny Desk Concert. It was like everybody from the building and people were standing on AV units, so it was a lot going on. There’s probably at most like 100 people watching Tiny Desk Concerts. I had 400, for some reason. So it didn’t make me nervous to actually do it, it just made me nervous to have that many eyes that close to me. People were really close to me! They didn’t show the crowd, but people were like right in front of me. It was kind of weird. Did they say why they wanted you to do it without Auto-Tune? Since then, have you been performing without Auto-Tune? I’ve never used Auto-Tune live for anything. Like onstage. Period. Do you have any regrets about being such an early pioneer of Auto-Tune? In retrospect, it’s almost prevented some people from taking your art seriously. No, I never regret it. Look at the industry now. It’s changed so much, and I feel great about that. And if I hadn’t done it, someone else would be able to say what I’m saying right now. So it’s actually pretty cool. I’m known for it, and it’s good to be known for anything. So I love that I did it. I always expected to get the backlash for it, because any originator of anything always gets the most hate from the actual thing that they created or innovated. How do you feel about the way Auto-Tune’s being used now? At this point, I don’t think anybody cares anymore. If you hear any evidence of Auto-Tune, it’s just like, “Alright, they’re using it, too.” It’s not good or bad. People have just come to terms with it. But it’s always been about the lyrics for me. People always say that if you just use Auto-Tune, then you’ve got a hit song. But you actually have to write a song. You can’t just yell and talk about cereal on a track, and put Auto-Tune on it and have a smash song. You still need to write a good song; it’s not really about how well you’re using [Auto-Tune]. You put out a new mixtape last week, The Iron Way, and it’s been very well-received. Are you surprised at how surprised other people are that it’s good? Not really. I’m hoping it wasn’t a big surprise. I felt good making it, and usually that’s how quote-unquote “hits” come about — if I feel good. Because I never really know when a song is an actual hit. It’s just the feeling it gives me when I hear it, and it’s a mixtape full of that. So I felt like people needed to hear it, and it needed to be free. So it wasn’t too big a surprise to me, but it was relieving. Why release a mixtape before your next album? Album processes are much harder. I needed a stress-reliever, and people were also wondering if I was still doing music. I’ve been writing for other people for so long that I haven’t really been paying attention to my own projects. So I wanted to let people know I’ve still got stuff coming. So this should hold people over until I do an actual album. Were any of these songs leftovers from the new album, or being considered for it? A lot of these were brand-new. I made songs just for this project. I went to [mixtape host] DJ Drama to see what his thoughts were on doing a mixtape. He came to me and said, “Yo, do you wanna do a Gangsta Grillz?” and I came to him and asked what kinds of songs he wanted me to do. Right after that, I went into the studio and just tried to get those tracks for him and make sure that I didn’t tarnish the Gangsta Grillz legacy. For as much as you’ve been out of the spotlight these past few years, you got a lot of collaborators on this mixtape — Lil Wayne, The-Dream, Bun B, Big K.R.I.T., etc. How did that happen? It was actually fairly easy. Just a text message and an email. [Laughs.] And that was pretty much it. People still got love for me, and there’s no love lost. No matter what I’m doing, I’m still a great friend to these people and still am very loyal to the cause. So it’s not really a task to get anybody to collaborate with me. There was supposed to be a track on the mixtape featuring unreleased vocals from Aaliyah, but it didn’t end up on the final tracklist. What’s the status on that song? The reason we held it back on the mixtape is actually because we got a call from her team, and they wanted to put it on her album. So that song’s gonna be on her album, Aaliyah X, which is basically like her final album. It’s full of collaborations and unheard vocals. When can we expect to hear that? They had like a ten-year wait, so pretty soon, actually. I can’t give any details from it, because it’s like a secret project — except for, you know, that it’s happening. But details on it have been held back. Can you tell me about your song on the project? It’s called “Girlfriends,” and it’s basically like a “[can’t beat ‘em,] can’t join ‘em” kind of feel. It’s about a girl always hanging with her girls, but also trying to do the stuff females think men do all the time. It’s definitely a pretty cool song. Young Fyre, one of its original producers, and I are actually gonna collab on the actual final version. It’s not so much a ballad, but it’s not a fast song. It’s pretty cool, it’s a good vibe. One song on the mixtape, “Let Me Through,” which features Lil Wayne, was supposed to be on the Furious 7 soundtrack, right? It didn’t make it on there, but you do have a cameo in the film. How did that happen? I think it was from the excessive hanging out that me, Tyrese, and Vin Diesel were doing. [Laughs.] I was always on set with them, and one day they were like, “Hey, man, do you wanna get in on this thing?” and of course, I’m not gonna say no to that. So I got to be a part of this whole Fast and the Furious legacy. You were in 2010’s Lottery Ticket, too. Do you have any interest in acting? I could see you on Empire. I’ve heard that a lot. [Laughs.] I don’t know why, because I don’t know what the hell is going on in that show. All I keep hearing about is Cookie. [Laughs.] I guess I’ll figure that out when I actually see it. You’ve spoken recently about suffering from depression over the last few years, and how people like Chris Brown and Ne-Yo helped you through it. Are you in a better place now? I’m in a great place, I’m in a much better place. It feels like the beginning again. That’s good to hear. What do you think helped you? Self-realization, stepping back and looking at myself and not blaming anybody else for my own depression. I was basically having a self-pity party, that’s pretty much what that whole thing was. Once you learn what that is, you gain some self-awareness and you start learning that it’s not anybody’s fault but your own. The way you let other people affect you, especially having them around you for so long, you know, it’s not their fault that they were there. And you accept that. That happens. When can we expect that new album? I’m thinking the end of September. I’m trying to drop it on my birthday [September 30]. I’m probably 200 songs in right now. Who have you been listening to for inspiration? FKA Twigs, she’s one of my favorite artists right now. I’m also super into James Blake right now, and Sampha. A lot of international artists. Will FKA Twigs be on your new album? Wait, she’s engaged? That’s news to me. 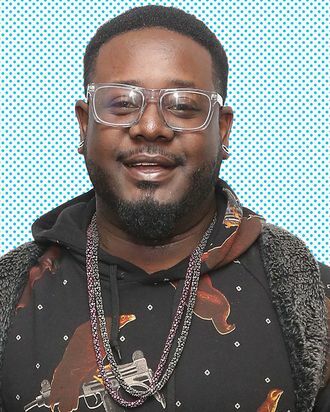 Update: T-Pain claims his seemingly accidental slip at the end of this interview regarding FKA twigs and Robert Pattinson’s engagement was in fact an April Fools’ Joke. April Fools? Update No. 2: People.com has confirmed that FKA twigs and Robert Pattinson are indeed engaged.